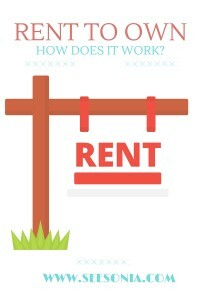 How Does Rent to Own a Home a.k.a. Option to Buy Work? Buying a home with an option to buy sounds easy at glance but it’s a bit difficult to explain since there are so many factors to take into account. When you are looking for a home to rent with an option to buy there are two components. You will need a contract that will have the negotiated amount between you and the seller. In this contract all the terms and price will be agreed to and there will be a future date for closing. Typically the agreement is set for 1-2 years out. At the end of the arrangement there will be an OPTION where the buyer can decide whether or not to exercise the right to purchase the home. In order to acquire that option, the renter/buyer must pay a one time, NON REFUNDABLE, fee called the option consideration. The exact amount is negotiable, but it is usually ranges from 3 to 7% of the purchase price. A fair contract will credit the buyer 100% of that option consideration upon closing of the sale. Along with the purchase contract the buyer and seller in this case would be the “tenant” and the “landlord“must also set up a rental agreement. The rental lease is separate from the purchase contract. Typically the difference is that the lease will not have a security deposit because it is stated on the purchase contract as earnest money. This contract also has to get negotiated and both parties have to agree. A negotiated percentage of all rent payments should be applied toward the purchase price of the home. Make sure you keep timely rent payments, maintenance is usually the responsibility of the tenant/buyer. Have I confused you yet? LOL, below is a quick run down in numbers. Let’s say you as the buyer have bad credit and cannot buy right now so the contract will be dated 1 year from now while you fix your credit situation. Pro: The advantage for buyers in leaving a large deposit upfront is that you are guaranteed that the home will be yours and you will already have a portion of your down payment saved up. The advantage for a seller would be in the case of someone who had already bought a new house they will have relief from paying two mortgages at once, and in a slow housing market with many homes for sale, this may be their best option. Also if the buyer leaves a bigger deposit upfront they are less likely to just walk away from the deal. Another advantage to the tenant which becomes a Buyer (via rent to own), there is an immediate sense of pride in ownership. Buyers add value to the community. They take care of their future property, make improvements, and feel good knowing their rent money is not being drained down the toilet. Also, since realtors are usually not involved with this type of transaction, there is no commission and the landlord can afford to pass along the savings to tenant/buyer in the form of rent credits. Con: For a buyer – what about if you find a better home and now you are stuck with this contract which you have to purchase a year from now? The con for a seller is what if the buyer wants to back of the deal and is willing to lose their earnest money (option consideration)?